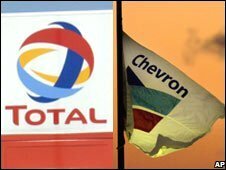 Chevron and Total have reported their three-month results, completing a strong week of data from the world's big five publicly-owned oil companies. Chevron reported April to June net income of $5.98bn (£3.03bn), 11% up on the same period last year. Total's net income rose 39% to 4.73bn euros ($7.37bn; £3.73bn). Exxon, Shell and BP also made strong profits in a period in which the average oil price was $125 a barrel, about double the level of a year ago. "In the second quarter, demand for oil remained strong, still pulled by Asia and the Middle East, despite signs of a slowing in the Atlantic basin," said Total's chief executive Christophe de Margerie. Exxon Mobil's profit rose 14% to $11.68bn, breaking its own record for the highest quarterly profit by a US company. Shell profits rose 5% to $7.9bn while BP's rose 6% to $6.85bn. Chevron confirmed the picture from many of its rivals that the high price of oil was making up for losses in its downstream operations such as refining and petrol forecourts. "The higher cost of crude oil used in the refining process was not fully recovered in the price of gasoline and other refined products," said Chevron's chairman and chief executive Dave O'Reilly. "As a result, our downstream operation incurred a loss in the second quarter."